The Ekinox combines an Inertial Measurement Unit (IMU), and runs an enhanced on-board Extended Kalman Filter (EKF) to fuse in real-time inertial data with GPS information. 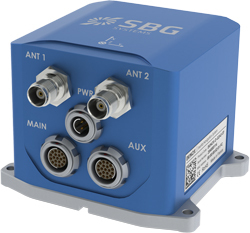 Apogee is a highly accurate Inertial Navigation System that connects to a SplitBox GNSS or any survey grade external GNSS receiver for optimal navigation. The ITAR Free Apogee-E is the most accurate and versatile INS based on the robust and cost-effective MEMS technology.